Solder Paste, SMD & SMT Rework Solder Paste, Long Shelf Life, Ships Fresh! Premium, Classic 63Sn/37Pb Solder Paste for Printed Circuit Board Soldering at the Bench. 6 Month Shelf. No Refrigeration. In-Stock! Always Fresh! Six Month Shelf-Life Without Refrigeration. Formulated Specifically for the Bench! 6 Month Life. No Refrigeration. 63Sn/37Pb. Military Grade! Your Classic Eutectic 63Sn/37Pb Solder Paste developed R&D groups, engineers and technicians for quality PCB work in labs or at the bench with new designs, prototypes or in rework and repair. Our now famous, high quality, no-clean SPE-0012 ZephPaste™ solder paste is used in the most prestigious national labs and campuses from NASA and Fermi to Sandia and Stanford. Why? Shiny, high-quality, reliable solder joints from a solder paste that exceeds all Bellcore Specifications and industry standards and with two decades of proven history! And our loyal customers -- from the 1990's --still rave about our paste. ZephPaste™ has real history. See the solder paste video below. Six-Month Shelf Life! No Refrigeration Required! The SPE-0012 soldering paste is a eutectic 63Sn/37Pb formula, distinct from other pastes marketed today. Filled into convenient 10cc syringes (or barrels), it is a low residue, no-clean paste with a unique flux/sphere ratio perfected for the bench. And it has a 6-month shelf life without refrigeration. Buy one, try it out, become impressed. Premium Formulation 'Stays Put' on Pads: With virtually homogeneous properties, the SPE-0012 paste 'stays put' once dispensed to your pads...and with our remarkable Zero-Balling™ attribute during soldering. What great news for those using the classic, traditional PCB tin/lead 63Sn/37Pb or 60Sn/40Pb soldering alloys! All Orders Ship From Factory "On Ice". Yes, ZephPaste™ has a 6-month shelf-life without refrigeration, and yet we still ship each order with cold packs. Why? So you receive the freshest paste possible. The 6-months shelf-life begins once you receive your paste. How about that? 2.) Standard, high volume-production solder pastes have very short shelf lives due to the flux/sphere ratios needed for conveyor oven reflow and require refrigeration. 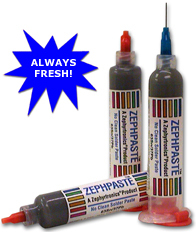 Zephyrtronics has eliminated that need to refrigerate your paste in the lab or at your bench after usage. Because solder joints made with solder paste are superior to those made with solder wire (especially with SMD's), Zephyrtronics developed a no-clean paste with a flux/sphere ratio requiring no refrigeration and specifically for the electronic bench. And our paste works perfectly with a non-contact hot air pencil and a preheated PCB. Easy. See the short, helpful 'How to Use Solder Paste Video' below. Production Quality Soldering at Your Bench! Shiny solder replete with shiny fillets on the toes, heels and sides of the chip's lead and pad interface! Our proprietary SPE-0012 Solder Paste formulation is the result of years of research, extensive laboratory and field testing. Solder paste doesn't get better. See video below. With 12 Grams of Paste. Two Decades of Quality History! With liquidous point of 183°C or 361°F, ZephPaste™ is the same paste that Zephyrtronics has demonstrated at electronic trade expos from Massachusetts to Munich to the delight of engineers, technicians and quality personnel. Recommended for use with the award winning Zephyrtronics low temp ZT-1000 AirBath Preheaters and the ZT-2-MIL Hot Air Pencil for non-contact solder reflow. See our technical papers History of the Hot Air Pencil, and Making Quality Solder Joints at the Bench, and pictorial process page Quality SMD Soldering or watch this short, helpful live demo video of "how to" use solder paste at the bench! Zephyrtronics introduced the ZeroTouch™ soldering method to the world. Extra long shelf life! No refrigeration! Meets all Bellcore specs! No-clean properties! And two decades of proven quality in use in some of the most prestigious electronic campuses on earth. Note: Always store your paste vertically. Ships On Ice! And even if you order a single syringe of paste, we'll ship it to you on ice! Why? So your 6-months shelf life begins when you receive it. How about that? No wonder our ZephPaste™ is so popular at the bench. And just wait until you see the quality of your solder joints! Ships with SDS. ALWAYS FRESH! ©1996 - 2011, 2012, 2013, 2014, 2015, 2016, 2017, 2018, 2019 by Zephyrtronics®. All rights reserved. The information, text, images, photographs, charts, graphs you receive online from Zephyrtronics® are protected by the copyright laws of the United States. The copyright laws prohibit any copying, redistributing, retransmitting, or repurposing of any copyright-protected material. Zephyrtronics is the registered trademark property of JTI, Inc. "The Science of Zephyrtronics" and "Simplicity Through Innovation" and "Zephlux" and "Zero Balling" and "Zero Residue" and "Post Cooling" and "Post Cooler" and "AirBath" and "SolderGlide" and "SolderMill" and "ZeroTouch" and "Just So Superior" are the protected trademark property of JTI, Inc. "Zephyrtronics" and "LowMelt" and "AirFountain" and "ZeroLead" and "Fountainhead" are the registered trademark properties of JTI Inc. *The above names are registered property of their respective owners.